If you are an active person that likes to try new things or you simply like to share the interesting activities you do and broadcast them to the world to see, letting others to join the fun, with the right social app on your smartphone you can easily do that. Because choosing the best app for these purposes is hard, we did our research and we have for you one real-life social networking app to share activities or join activities shared by others. Let’s discuss it. Developed for IOS users and suitable for everyone that likes to share interesting things they do while meeting new and interesting people that join that experience. On this real-life social networking app all users are allowed to share and join activities at any time with any one. The activities posted by users are broadcasted to the world to see and the users that are interested can join the fun. 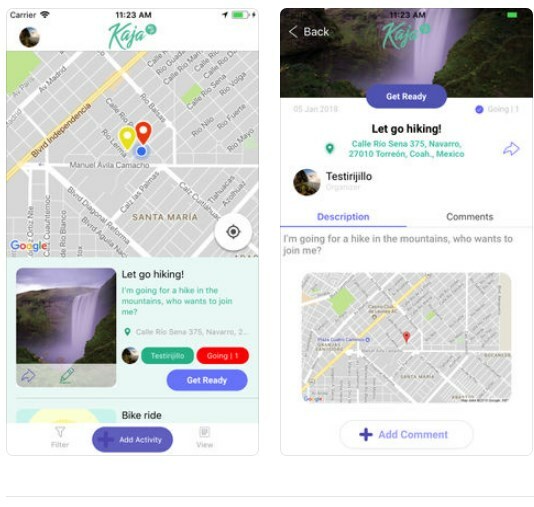 Users that like to try new things and make memorable moments they can choose the most exciting activity nearby posted and join users to have fun. By using the app, users will certainly have many opportunities to choose from while having the chance to meet new and interesting people that have common interests with. Kaja has many incredible features to offer that will keep the user’s attention and help him find the perfect activities that suit his taste or to share them his activities and find people to join him on the experience. With the app’s help, users will easily announce and broadcast the activities they do in the moment with other users to see and anyone can choose to join them on the exciting experience. Users that look for new and interesting things to do, they can use the location to find and choose the perfect activity for them nearby or on other locations, joining users and meeting new friends. With each activity, users can post their photos, videos and comments and these posts will exist as long as the activity is active and other users will be able to see those amazing moments. With its own level of privacy on each activity, users are always safe and protected on the app. Users can manage and organize activities of any type, like parties, trips, activities or anything they can think of! Download the app on App Store for free to choose and join the activity you like!